Nominations will be open for the 2016 Global Water Awards from 5 November 2015 to 31 January 2016 at www.globalwaterawards.com, organised by Global Water Intelligence and sponsored by Evoqua Water Technologies. GWI established the Global Water Awards in 2006 out of a desire to recognise the initiatives and projects that were really doing something to make the world of water work better. Now in their 9th year, these Awards are about capturing what is new and what is working and making a difference to water. We’re looking for those initiatives in the water, wastewater and desalination sectors that are moving the industry forward through improved operating performance, innovative technology adoption and sustainable financial models. From tomorrow, you have until 31 January 2016 to nominate. After that date, our panel of experts will begin the difficult task of filtering out the short list. With the shortlist published online and in print in February 2016, voting will be open to readers of Global Water Intelligence and the Water Desalination Report, and members of the International Desalination Association (IDA). The winners will be announced at the Global Water Awards Gala Dinner to be held as part of the Global Water Summit 2016. The two day Summit will be held on 19-20 April at the Jumeirah Etihad Towers in Abu Dhabi. 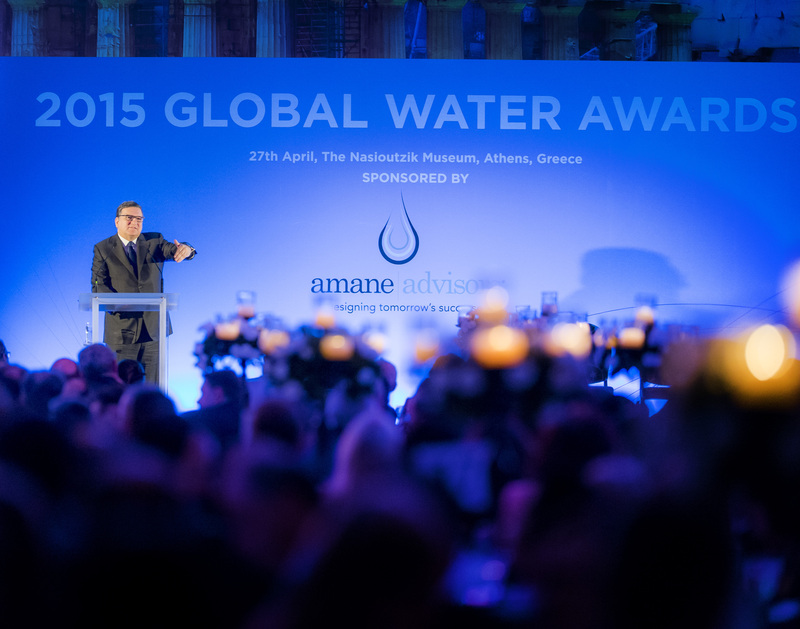 The Global Water Awards Gala Dinner will be held on the evening of 19 April at the Emirates Palace. Yes, you can nominate the same project/initiative/company in multiple categories – but you cannot nominate the same project/initiative/company multiple times in the same category. Think about it: this is a nominations process, not a voting process. Once we get your nomination we get your point. We will definitely need your 200 word description outlining why the project/company/initiative has brought value to the international water industry. This has to be specific and tied to the idea of demonstrating why the project/initiative/company is unique and valuable. Avoid generalities that merely point out that everyone thinks your project/initiative/company is great. We need a concrete means of comparing your nomination to others. Water Company of the Year – For the water company that made the most significant contribution to the development of the international water sector in 2015. Desalination Company of the Year – For the desalination plant supplier which has made the greatest overall contribution to the desalination industry in 2015. Public Water Agency of the Year – For the public sector organisation that made the greatest contribution to meeting the challenges of water supply during 2015. Desalination Plant of the Year – For the desalination plant, commissioned during 2015 that represents the most impressive technical or ecologically sustainable achievement in the industry. Water Reuse Project of the Year – For the project, delivered during 2015 that represents the most significant advancement in terms of water reuse. Industrial Water Project of the Year –For the project, commissioned in 2015, that represents the most impressive technical or environmental achievement in the field of industrial water. Desalination Deal of the Year – For the deal, closed during 2015, which represents the most significant step forward for the industry in terms of financial innovation or in meeting the demands of challenging circumstances. Water Deal of the Year – For the financial initiative, signed in 2015, which has made the biggest contribution to the advancement of private sector participation in the international water sector. Water Technology Company of the Year– For the company which has made the most significant contribution to the field of water technology in 2015. Water Performance Initiative of the Year – For the initiative undertaken by a water utility during 2015 which represents the most significant commitment to improving the long-term performance of water services to the public. Corporate Water Stewardship Award – For the commercial or industrial organisation that has made the greatest contribution towards the sustainable management of its water cycle or in reducing its water risk exposure during 2015. Water Technology of the Year (Tech Idol) – For the early-stage company whose technology could change the future of the water market. GWI reserves the right to change or amend these categories at any time during the nominations period, depending on what level of response we get in the various categories. The Global Water Awards will take place at the Global Water Summit 2016 on 19 April in Abu Dhabi a the Gala Dinner held at the Emirates Palace and sponsored by Evoqua Water Technologies.